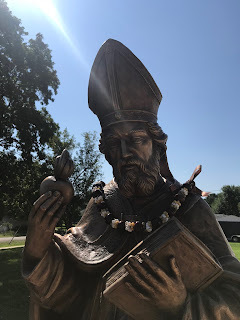 We here in the central plains of Illinois are blessed to have as our patron the Doctor of Grace, a man very much like us from the coast of North Africa in present-day Algeria. There is hardly a saint who has remained so close to us, so understandable, despite the lapse of centuries, as St. Augustine, for in his writings we encounter all the heights and depths of the human spirit, all the questioning and seeking and searching that are still ours today. He has not unjustifiably been called the first modern man. He was born in an age of crisis and transition that was only too like our own, an age in which faith was not something taken for granted but had to be sought and found in the midst of human experience and of the abysses it opens to the heart of man. Anyone who has picked up a copy of his Confessions, The Happy Life, or read even a few of his sermons realizes quickly that his questions, answers, and insights resonate in our hearts today, though on the surface we are very different from him. He then received Baptism from Saint Ambrose in Milan and returned to Thagaste in North Africa. He next settled at Hippo Regia where he established a monastery and sought to live a quiet life in prayer and writing. But God had other plans, and so did the people of Hippo because the reputation of his newfound holiness preceded him. No one would like more than I the steady, tranquil repose of contemplation. Nothing could be better, nothing sweeter, than the study of the divine treasure far away from the noise of the world. Such study is sweet and good. On the other hand, preaching, reprimanding, correcting, building up and attending to the needs of others is a great burden, a great responsibility, and a great weariness. Who would not wish to avoid such a burden? But the Gospel affrights me. Saint Augustine knew what he wanted to do, but – more importantly – he knew what he had to do, and he did it out of love for God and neighbor. Last year, on the occasion of this great solemnity, our patronal feast day, we heard these same readings. We reflected then on the great line of Saint Augustine that “our love, like a fire, must first take hold of what is nearest and then spread to what is further off.” We also reflected on the image of his burning heart, which he holds out to us, inviting us to take hold of it and to allow the fire of his love to ignite our own. …there can be no love without suffering, because love always implies renouncement of myself, letting myself go and accepting the other in his otherness; it implies a gift of myself and therefore, emerging from myself. All this is pain and suffering, but precisely in this suffering caused by the losing of myself for the sake of the other, for the loved one and hence, for God, I become great and my life finds love, and in love finds its meaning. The inseparability of love and suffering, of love and God, are elements that must enter into the modern conscience to help us live. Though it took him nearly half of his life to allow his heart to be touched by God, to repent of his life of sin, and to be chained to God and his people, Saint Augustine did at last allow his heart to be set afire by Love and enkindled this love within the hearts of others. It was through the suffering of love for God and neighbor that he found the peace for which his heart so desperately longed. Through the intercession of Saint Augustine, may we never shy away from taking up the Bible and doing what we read; may we never be afraid to yield our hearts to the love of God and to lead others into it; and may we never be afraid of the suffering that comes from love so as to find the peace our hearts desire. Amen. Joseph Ratzinger, “Sermon for the Feast of St. Augustine,” in Dogma and Preaching, trans. Matthew J. O’Connell (Chicago, Illinois: Franciscan Herald Press, 1985), 119. Saint Augustine of Hippo, Confessions, VIII.29. Henry Chadwick, trans. (Oxford: Oxford University Press, 1991), 153. Ibid., Ten Homilies on I John, 8.1. In Thomas C. Oden, et al, eds., Ancient Christian Commentary on Scripture, New Testament Vol. XI: James, 1-2 Peter, 1-3 John, Jude (Downers Grove, Illinois: Inter Varsity Press, 2000), 214. Pope Benedict XVI, Address to the Clergy of the Diocese of Belluno-Feltre and Treviso, 24 July 2018. Romano Guardini, The Rosary of Our Lady (Manchester, New Hampshire: Sophia Institute Press, 1998), 49. We have heard for the past several weeks of Jesus’ desire to give himself completely, for us to the point of offering himself on the Cross for our salvation and of giving himself to us as our true food and drink (cf. John 6:1-69). Today, he asks us, “Does this shock you” (John 6:61)? No doubt there are many today who are indeed shocked at so great a love. In an age of ever-increasing self-absorption and of strident, independent individualism, so self-less a love seems unfathomable. Yet this love is true. Jesus did and does love us with a depth greater than we can comprehend. Some doubt such a love and others do not desire to be loved so intimately. At what point in this spectrum are you? Today, many people’s ability to accept the love of Jesus is related to their upbringing. Saint Paul realized the profound relationship between marriage and God’s own love and for this reason said, “This is a great mystery, but I speak in reference to Christ and the Church” (Ephesians 5:32). The portion of his letter to the Ephesians which we have just heard finds little support in society today, and for this reason many marriages have failed because they have not rooted their love in the love of Jesus Christ; they have not measured their love according to God’s way of loving. Because of our fallen and sinful condition, we strive for independence and long for what we call freedom, but which is really mere license. When we attain what we seek we find ourselves not free, but slaves to our own desires and passions. Saint Paul shows us the way out of this vicious cycle of self-enslavement and opens for us the path to authentic freedom. “Follow the way of love,” he says earlier in the same letter, “even as Christ loved you. He gave himself for us” (Ephesians 5:2). Who would say that Jesus was not free, freer than any one of us has ever been? It is true that he was obedient to the Father even to the point of death, but it is equally true that he freely chose the way of obedience. His was the obedience not of enslavement, but of love; it is this obedience of love that Saint Paul urges wives to live when he says, “Wives should be subordinate to their husbands as to the Lord” (Ephesians 5:22). Before we grow angry with Saint Paul and think him a bigot, we must remember what he writes just before this so-called controversial statement: “Be subordinate to one another out of reverence for Christ” (Ephesians 5:21). As Christ loved us, so we are to love one another. Because wives are to love their husbands as they would love Christ, they should be subordinate to them “because the husband is head of his wife just as Christ is head of his body the church” (Ephesians5:22). Before saying anything further, we must consider what it means to be “subordinate” to someone. The Greek verb is hypotasso, which means literally ‘to place or arrange under.’ Here it occurs in the middle voice (hypotassomai) with the meaning ‘to place oneself under,’ or more simply, ‘submit oneself to’ or ‘defer to.’ It is clear from the context that voluntary subordination is intended, like the other voluntary expression of Spirit-filled life mentioned [by Paul]. The truly unusual nature of this instruction is that Paul tells his readers to submit themselves to one another, still addressing all the members of the community. At first this seems contradictory. How can two individuals place themselves ‘under’ each other? … The meaning of this unusual instruction becomes clearer in the light of similar texts that teach about relationships in the church… Reciprocal humility and love determine even the relationship that entail authority… Undoubtedly, behind this teaching stands Jesus’ own teaching about leadership as service (Luke 22:25-27), which was demonstrated and explained when he washed the feet of his disciples (John 13:13-15), foreshadowing his humbling himself for our sake on the cross. Here we see clearly that God’s way of loving becomes the measure of human love. The head of the body always looks to the good of the body, to its health, safety, and satisfaction. This is how Christ cares for his Bride, the Church, and this is how husbands are to care for their wives. What is more, Saint Paul says, “Husbands, love your wives, even as Christ loved the Church and handed himself over for her to sanctify her” (Ephesians 5:25). Every husband, then, must be filled with so selfless a love for his wife that he is ready and willing to lay down even his very life for her. If a husband loves his wife in this way, there is no difficulty in deferring to him. Again, we see clearly that God’s way of loving becomes the measure of human love. Certainly, to live in this way is no simple feat and for this reason, in his goodness, Christ the Lord has raised marriage to the dignity of a Sacrament and has bestowed his grace upon it to enable husbands and wives to live in such away that the love of Christ for the Church is reflected in their marriage. Christ’s grace is not an external addition to human nature, it does not do violence to men and women but sets them free and restores them, precisely by raising them above their own limitations. And just as the Incarnation of the Son of God reveals its true meaning in the Cross, so genuine human love is self-giving and cannot exist if it seeks to detach itself from the Cross. We can say, then, that the love of husband and wife is in some way a Eucharistic love, a love that must imitate the selfless and self-giving love of Jesus Christ. Husbands and wives must give themselves to each other completely, just as Jesus gives himself completely for us. When a husband cares more about himself than his wife, a marriage begins to fail. When a wife cares more about herself than her husband, a marriage begins to fail. This, too, is a hard saying. It is only by following the way of love and by deferring to one another out of reverence for Christ that we find true freedom; it is only by imitating the self-giving love of Jesus that we find everything we seek in life. May the Lord, then, lead us deeper and deeper into the mystery of his love until our love perfectly reflects his own, until the measure of our love is the measure of his love. Amen. Peter S. Williamson, Catholic Commentary on Sacred Scripture: Ephesians (Grand Rapids, Michigan: Baker Academic, 2009), 155-156. Pope Benedict XVI, Address to Participants in the Diocesan Convention of Rome, 6 June 2005. The counsel of Saint Paul, which we heard just a few moments ago, seems particularly timely in light of the dreadfully demoralizing and heart-rending news of these past few days (I will speak only generalities so the young ones can stay). “Watch carefully how you live,” he says, “not as foolish people but as wise, making the most of the opportunity because the days are evil” (Ephesians 5:15-16). We are learning in greater detail what we already learned many years ago, namely, how foolish those who were supposed to be wise have been and how those who should have been attentive shepherds did not watch carefully even over their own lives. In these evil days, we are reminded once again of the pitiful condition of fallen humanity and of the reality of pride and sin. Even those consecrated to God through the Sacrament of Holy Orders are not immune from sin – not even from mortal sin – and must strive each day to “understand what is the will of the Lord” (Ephesians 5:17). certain temporal consequences of sin remain in the baptized, such as suffering, illness, death, and such frailties inherent in life as weakness of character, and so on, as well as an inclination to sin that Tradition calls concupiscence, or metaphorically, “the tinder for sin;” since concupiscence is left for us to wrestle with, it cannot harm those who do not consent but manfully resist it by the grace of Jesus Christ. Indeed, “an athlete is not crowned unless he competes according to the rules” (II Timothy 2:5). In a time when many people – both within and without the Church – deny the reality of sin, the reality of sin now stares us in the face and we see, once again, the need for confession, a firm amendment of life, and of penance. Each Sunday, we profess our belief in “one, holy, catholic, and apostolic Church.” Given what many churchmen have been involved in, how can we continue to make this profession? We can do so because Christ Jesus “loved the Church as his Bride, giving himself up for her so as to sanctify her” and “joined her to himself as his body and endowed her with the gift of the Holy Spirit for the glory of God.” It is his love and her union with him that makes the Church holy. At the same time, however, “in her members perfect holiness is yet to be acquired.” We know this even in our own daily lives; we fail to love as fully as we should and every sin is a failure to love; we are not all saints, though we are called to be. The Church is therefore holy, though having sinners in her midst, because she herself has no other life but the life of grace. If they live her life, her members are sanctified; if they move away from her life, they fall into sin and disorders that prevent the radiation of her sanctity. This is why she suffers and does penance for those offenses, of which she has the power to free her children through the blood of Christ and the gift of the Holy Spirit. Those who enter fully into the life of the Church understand this. None of this is said to excuse what has been done by some within the Church. The acts committed are heinous and mortally sinful, and place the souls of those who committed then in grave peril without a sincere repentance. Because of our different personalities, each of us will respond to such news in different ways. Some will be spurred to more frequent prayer and penance; others will be justifiably angered and work towards reform; still others will become despondent and consider leaving the Church. 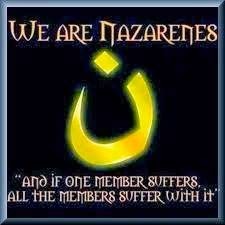 I think I am as sensitive as you (or any other Christian) to the scandals, both of clergy and laity. I have suffered grievously in my life from stupid, tired, dimmed, and even bad priests; but I now know enough about myself to be aware that I should not leave the church (which for me would mean leaving the allegiance of Our Lord) for any such reasons: I should leave because I did not believe, and should not believe anymore, even if I had never met anyone in [holy] orders who was not both wise and saintly. I should deny the Blessed Sacrament, that is: call our Lord a fraud to His face. Now is not the time to abandon the Church, but to entrust ourselves all the more to the merciful love of God and to beg him to make a saint of each one of us. Where else could we go? Where else can we receive the Bread of Life? Where else can we live the full life of grace? Anger and sadness are the correct response to the travesty of sin and a negligence of true pastoral care. This we see in the life of Jesus himself. His anger and sadness led him to intense prayer so that he might sanctify us and make us holy. Let us today, then, offer our anger and sadness to the Lord and ask him to purify his Church again, as he has done throughout the centuries. Let us watch carefully over how we live and beg the Lord to make us a community of saints. Amen. Catechism of the Catholic Church, 1264. Catechism of the Catholic Church, 825. Blessed Pope Paul VI, Credo of the People of God, 19. J.R.R. Tolkien, Letter to Michael Tolkien, 1 November 1963. Saint Augustine of Hippo, Expositions of the Psalms, 34.11. By appealing to the authority of the Risen Lord, Saint Paul insists that we who have been baptized into Christ “must no longer live as the Gentiles do” (Ephesians 4:17). Given the particularities and standards of the society in which we live, these are timeless words and a command we cannot ignore. It is because “truth is in Christ” – indeed, because Christ is the truth (cf. John 14:6) – that we should “put away the old self of your former life,” that is, the way of those who are not in Christ, the way of those who do not think and act in the light of the Paschal Mystery (Ephesians 4:22). It is not a matter here of following an idea or a project, but of encountering Jesus as a living Person, of letting ourselves be totally involved by him and by his Gospel. Jesus invites us not to stop at the purely human horizon and to open ourselves to the horizon of God, to the horizon of faith. He demands a single act: to accept God’s plan, namely, to “believe in him whom he has sent” (John 6:29). To use Saint Paul’s phrase, Christianity is about learning Jesus Christ, a learning which culminates in his friendship and in the reception of his own Body and Blood that “gives life to the world” (cf. Ephesians 4:20; John 6:33). I mention this because, just a few days ago, His Holiness Pope Francis altered the text of the Catechism of the Catholic Church referring to the death penalty. He did so to clarify the Church’s moral teaching in the modern world. Some have called the alteration of this text a change in the Church’s moral teaching; strictly speaking, this claim is untrue. The Church has always recognized the need of governments to protect their citizens. It sometimes happens that the only way to protect civilians requires the government to take the life of a dangerous criminal. While the Church tolerated capital punishment in past centuries, in more recent times there has been a clear and gradual development of the Church’s teaching regarding the death penalty. Pope Saint John Paul II reminded us that “not even a murderer loses his personal dignity, and God himself pledges to guarantee this,” as we see with the mark of Cain, who killed his brother Abel (cf. Genesis 4:15). He also noted that “modern society has the means of protecting itself, without definitively denying criminals the chance to reform” and for this reason he continually appealed for the end of the death penalty, which he called “both cruel and unnecessary.” Likewise, Pope Benedict XVI also called for the end of the death penalty. Consequently, the Church teaches, in the light of the Gospel, that “the death penalty is inadmissible because it is an attack on the inviolability and dignity of the person”, and she works with determination for its abolition worldwide (2267). Judging the signs of the times, the Holy Father has judged the the death penalty is no longer necessary due to the advances in detention systems. He is calling us to no longer live as the Gentiles do, but to learn Jesus Christ, to learn his mercy and the futility of vengeance. When Saint Augustine reflected on how unlike the Lord Jesus he was, he wrote in his Confessions that he “heard as it were [Jesus’] voice from on high: ‘I am the food of the fully grown; grow and you will feed on me. And you will not change me into you like the food your flesh eats, but you will be changed into me.’” To be changed into Jesus Christ, to think and act according to his mind and heart, is the goal of every Christian. Let us pray, then, that we will learn Jesus Christ ever more closely and, receiving his own Body and Blood, will be changed into him. Amen. Pope Benedict XVI, Angelus Address, 5 August 2018. Pope Saint John Paul II, Evangelium Vitae, 9. Ibid., Homily in the Trans World Dome of St. Louis, 27 January 1999. Pope Francis, Address to Participants in the Meeting organized by the Pontifical Council for the Promotion of the New Evangelization, 11 October 2017. J.R.R. Tolkien, The Fellowship of the Ring: Being the First Part of The Lord of the Rings (New York: Houghton Mifflin Company, 1994), 58. Saint Augustine of Hippo, Confessions, VII.10. Henry Chadwick, trans. (Oxford: Oxford University Press, 1998), 124.